The motivation for the project is non-profit work I want to do in the future with at-risk minority youth here in Orange County, CA. I want to create something that can be built in phases that get increasingly complex as the students learn, but that starts simple enough to enable hands-on participation from day one. Software improvements will be made in each iteration. Each plush animal will house electronics that will be “surgically” implanted. While the project is being designed I’m thinking of using soft circuits or even cardboard circuits wired with EFT tape instead of stripboards to make it easy to modify them while I’m still making decisions. One of my requirements – due to the non-profit nature of this project – is to try to keep cost as low as possible, but maintaining simplicity. For example, even though the cheapest possible Arduino may be a homebrew version, I decided I will be using the Ardweeny (it is cheap enough and simpler to put together). Another example of the cost x simplicity trade-off is the Internet of Things aspect of the project. The WiFi RedBack costs $69 at the time of this writing (but includes the Arduino), versus $24 for the barebones WiFi module (the MRF24WB0MA by MicroChip). I’m just not sure if the savings are worth the added complexity. (Here’s an example that uses this module). I also have to consider only one of the nodes/objects needs to have WiFi capability. 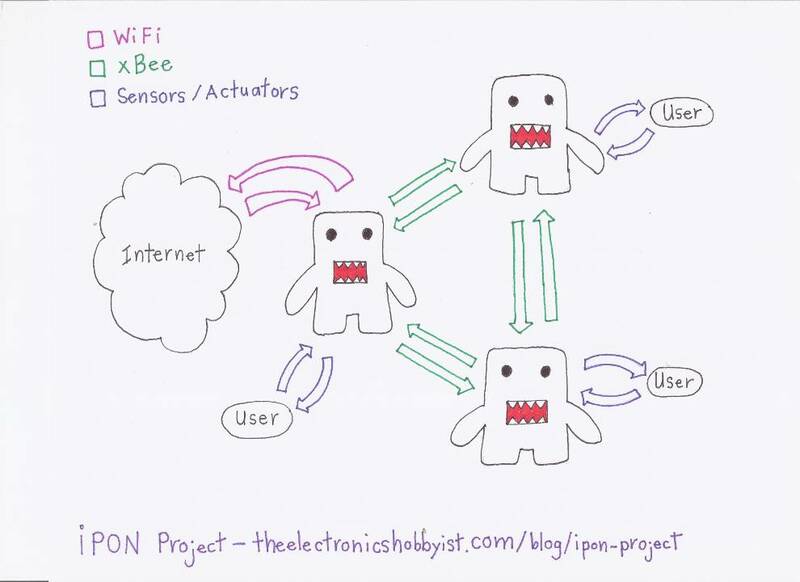 Communication within the networked objects will happen over XBee. Another factor that will drive design decisions is power – I want to learn how to design for lower power, and I’m aware this may be a whole subject all on its own given the many choices of battery types and cost considerations as well. Baby steps. I’ll get there. On the next post I will share the current state of the project, Phase 0 as described above, including circuit and Arduino sketch. Stay tuned! this is so cool especially the part about working with at-risk teenagers. My husband and i had a lego team. we had to meet with kids to teach them about nono technology and programming and then we entered are finished lego project in a competition where our finished project had to go through a set of obstacles, a maze all programatically. It was exhausting but the kids really enjoyed it. I think the kids are going to love DOMO too. I’m also interested in writing up other people’s projects – contact me. Contact information can be found through the above link. I can help you with your power supply design. Contact me. Althougt it can’t be considered a homebrew version, it’s cheaper, smaller and without work. I hope this info can be useful for someone. I also got excited about the Pinoccio, which I helped fund on IndieGoGo a while ago, they should start shipping the first units soon. I will write about it here on the blog once I get mine. Thanks again for reading and taking the time to comment. I appreciate it! Thank you for reading and taking the time to comment. I appreciate your feedback (though certainly not the tone of your message; but hey, this is the interwebs, so the “tone” perceived by the reader may not necessarily be the same one intended by the author). To your credit you started your comment with “I’m sorry”. Here’s the deal: sounds like I need to rewrite this post to make it clearer. Sometimes I run into issues of English-as-a-second-language, despite being a US citizen living here for almost two decades now. If you talk to me in person, you will notice I have an accent, too. (“Alexa, add rewrite I-P-O-N post to my to-do list”) – Isn’t she awesome? Anyhow, I took away the following points from your feedback, and I will try to address each one. 1) Using a character that is a registered trademark to which I have no rights. My drawing was unfortunate. 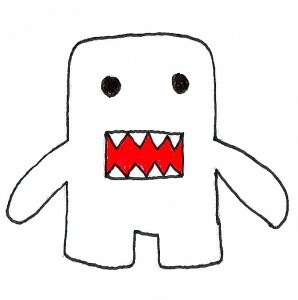 I do not intend to create Domo bots or dolls, or whatever. 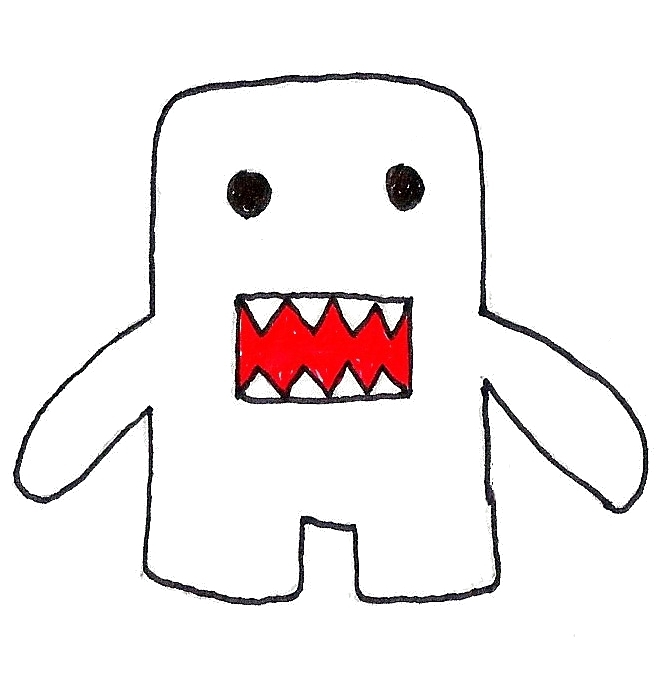 Since I am using a Domo doll that I picked from a $5-bin at a CVS checkout, when I drew the diagram, I used that figure because it was what I had in front of me. I shall re-craw using “happy clouds”, or something generic. There will be no “official” character in this project. The idea is to try to keep costs low. The intended “hosts” for the electronic “guts” will ideally be plushies picked up from Goodwill, dumpsters, hand-made, or up-cycled from plastic litter, etc. Creativity in coming up with a form to house the electronics is part of the project itself, in a fun “McGyver” way of trying to re-purpose things. The point is to MAKE the entire object from scratch. 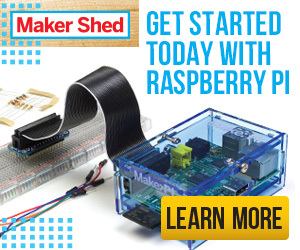 Groups of teens will build, wire and program these objects on their own, from scratch. At the end of one round of the program, interactive, networked objects will exist, that did not exist before, except in scattered-components-form and a blank IDE screen waiting to be populated by code. I hope this clears any confusion the original post may have caused. PS: This message prompted me to create a “comments policy”, so when you see one, note that this was the “historical” point when one became necessary. I don’t usually strip comment authors of their name and URL, but the message above did not include a name, and was posted under the title of a hateful organization, and contained a link to said hateful organization website (ironically and *especially* considering that this post is about empowering minorities).